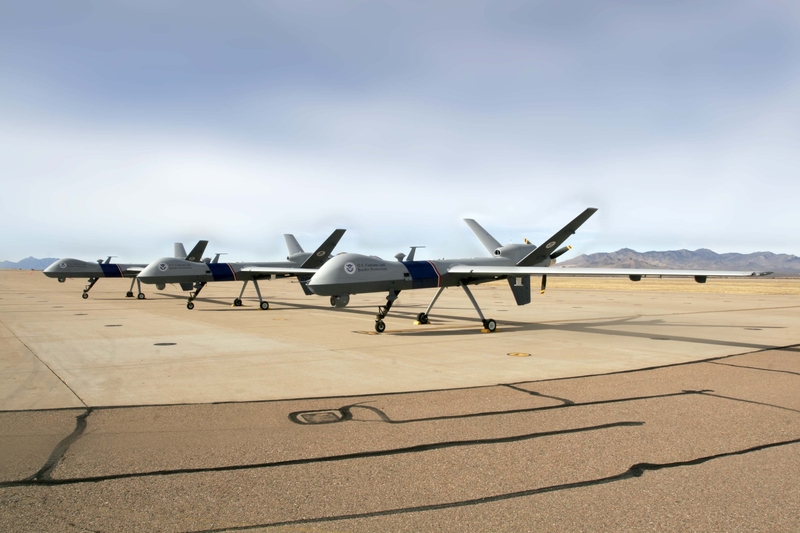 On a remote tarmac, three steel-gray “Predator B” drones sit motionless, awaiting launch. Their tips balloon into metallic bulges that conceal sophisticated navigation and surveillance equipment. Their undercarriages sport pivot-mounted cameras, each capable of rendering detailed images from high in the air. All three surveillance drones are operated by the United States Customs and Border Patrol – a component of the federal Department of Homeland Security. According to recently obtained federal documents, the agency has flown such vehicles over undisclosed parts of Minnesota on a long-term basis. Much of the available public information on domestic drone operations has come from records requests and lawsuits pursued by the press and civil society organizations. Saint Paul-based transparency nonprofit Public Record Media has filed several such requests, and also went to federal court in 2012 to learn more about domestic drone activities. Two years ago, PRM began seeking records from the Federal Aviation Administration (FAA) related to Minnesota drone operations. At present, the operation of unmanned aircraft in U.S. airspace requires a waiver from the FAA. The waivers – called Certificates of Operation (COAs) – set out parameters for operating areas, emergency procedures, payloads, and other matters. Drone COAs are issued for a specific period of time, and must be renewed by the FAA. PRM’s first Freedom of Information Act (FOIA) request to the FAA produced specifics about the twelve COAs that had been issued in the state of Minnesota as of November, 2012. By mid-2013, the FAA had produced a list of those COAs – including both canceled, expired, and active certificates. Most of the COAs had been issued to two organizations – either the Minnesota Army National Guard, or the University of North Dakota. The Becker Soil and Water Conservation District had also received a COA in 2011, but it had been canceled by the time that PRM’s FOIA request was fulfilled. Records indicated that the state’s remaining, active COAs were for the Minnesota Army National Guard and the University of North Dakota. In November of 2013, PRM filed a second FOIA request with the FAA, seeking the state’s active drone COAs, including certificates issued to the U.S. Customs and Border Patrol (CBP). CBP operates under the auspices of the Department of Homeland Security (DHS). In January of this year, PRM obtained details of DHS drone operations in Minnesota through a data request filed with the Minnesota Department of Public Safety. That request yielded information indicating that the department had used DHS drones to conduct aerial surveillance of suspected marijuana grow operations on public lands. The FAA responded to PRM’s second request on February 14th, and noted that the agency held records relating to both the University of North Dakota and the Army National Guard. It stated that the production of records would be delayed due to an ongoing federal lawsuit. In that same letter, the FAA also maintained that it did not hold records related to Border Patrol/DHS use of drones. PRM subsequently responded to the FAA and cited the letter it held about the use of Homeland Security drones in Minnesota. The reference prompted the agency to note the existence of such drone records in its follow-up correspondence. On August 8th, the FAA produced its first batch of records in response to PRM’s FOIA request for COAs. The documents were related to two separate certificates issued to the Department of Homeland Security. Both COAs applied to the use of Predator drone aircraft – the same unmanned aircraft used by the U.S. military to launch missile attacks in Yemen and Pakistan. However, FAA records indicate that domestic, DHS Predators are barred from “dropping or spraying” aircraft stores – including ordinance – “outside of active restricted zones.” The same documents also indicated that the use of the department’s Predator drones aligned with “long duration surveillance” missions. Each DHS COA related to a specific departmental mission – one long-term, and one of brief duration. The more limited mission involved the transit of a Predator Drone to the Airventure Air Show in Oshkosh, Wisconsin. This “air show” COA was submitted to the FAA in early 2009. The longer-term mission related to a drone flown out of the Grand Forks air base for an unspecified “national security” operation. Specific details of the mission – including the area of operation – were redacted by the FAA. Certain provided documents – labeled as “flight operations” maps – were entirely blacked-out. However, other information contained in the documents suggested that the operations area involved the U.S.-Canadian border. Both COAs contained unredacted details about the operation of the Predator drones, including certain safety measures. For instance, the certificates stated that drone operations required visual observers – either on the ground or in nearby chase planes – in specific situations. The documents also included extensive details related to contingency protocols to follow in the event of a “lost link” with a drone control station. Many of the specifics were redacted by the FAA. The COAs stipulated that drone pilots (who operate out of ground-based control trailers) must only log a specific number of flight hours before changing shifts. The FAA documents also included photographs of such control stations, as well as photographs of the Predator drones themselves. Most of the redactions found in the FAA documents were made on the basis of FOIA Exemption 7 – the statute’s “law enforcement” exemption. Drone documents obtained through other FOIA requests contain similar redactions, largely made under the same legal assertions. According to a recent Washington Post article, the White House is preparing an executive order that would require federal agencies to disclose more information about the use of drone aircraft within the continental United States. The article notes that the proposed order would mandate disclosures about the location of drone operations, as well as details regarding surveillance capabilities and data collection. In regard to the immediate future, the FAA has informed PRM that it will be releasing further COA documents in response to our 2013 FOIA request.